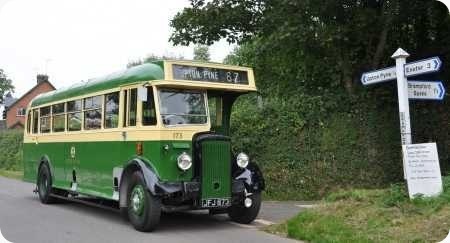 Until 1956, Exeter Corporation’s only experience of the Gardner engine came with five Bristol GO5G buses of 1935. All had gone by 1948. 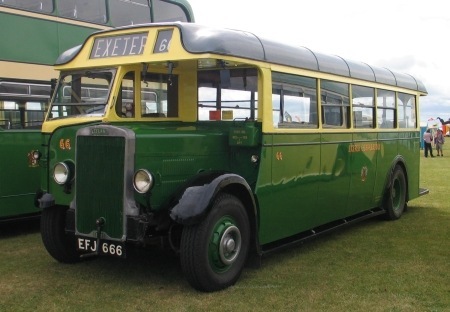 Exeter did not accept any utility buses until 1944, but these were seven Daimler CWA6, and ten more of the same type followed in 1945. It appeared that the Corporation had set its face determinedly against the Guy Arab. In the years up to 1950, the Daimler CWD6/CVD6 rather than the Gardner powered alternative then became the favoured chassis, a total of thirty three entering service, apart from a batch of seventeen Leyland PD2/1 in 1947. After 1950, Exeter did not order any new buses until 1956, when the Corporation turned unexpectedly to the 6LW powered Guy Arab IV, variously with Massey, Park Royal and MCW bodywork. Guy Arab IV UFJ 297, No. 57 of 1957 is seen in Exeter Bus Station in the early summer of 1970, shortly after the sale of the Corporation’s passenger transport interests to the National Bus Company, which sadly occurred in April of that year. The supremely elegant H31/26R Park Royal body style with the deeper saloon windows is essentially similar to those being delivered to East Kent on tin fronted Arab IVs at that time, and it amply illustrates the catastrophic collapse in design standards from the sublime to the ridiculous that subsequently afflicted that formerly respected coachbuilder. Apart from a delivery of five Leyland PD2/40 in 1958, Exeter stayed with the Arab until 1960, when Guy, besotted with its new wonder Wulfrunian, withdrew the Arab from the market. I didn’t know Guy withdrew the Arab from the market in 1960. Its absence can’t have lasted long, as Lancashire United received Arab IVs in 1960, 1961 and 1962, and Arab Vs from 1963 onward. Yes, Guy did take the Arab off the market, convinced that the Wulfrunian would conquer in its place. In 1960 the Guy company collapsed and Jaguar took over the Wolverhampton business. It was pressure from established aficionados of the marque, together with the almost universal rejection of the troublesome Wulfrunian that then quickly led to the reinstatement of the Arab. The slightly earlier Massey bodied Arab (superbly maintained by Wyvern Omnibus Ltd) appeared at the GWR (Gloucestershire & Warwickshire Railway) 1940s weekend earlier in the year. The crest and name are particularly impressive. The photos were taken by Mr Ray Phillips aka "Ray the Spiv", sometimes seen on wanted posters at 1940s events! Magnificent bus, and what sound-effects! Colin Shears told me that when faced with the choice of which of the Massey-bodied batch to preserve he went straight for TFJ 808, as it had the most musical gearbox of the lot. What a pity, though, that none of the Park Royals survived. A question: was the Arab IV available to the end, or was it replaced by the Arab V? Firstly, I should correct the date I gave in my comment above. Guy went into receivership and was bought by the Jaguar Group in 1961, not 1960 – apologies. Turning to Ian’s enquiry, the Arab V, which was introduced after the Jaguar takeover, was fundamentally a Mark IV with a chassis frame lowered by 2½ inches enabling the forward entrance to be accessed by just two steps instead of the three usual on conventional front engined chassis. Thus the Mark IV was simply supplanted by the Mark V in production until the last Mark Vs were delivered to Chester in 1969. Since this is a discussion emanating from a 27-foot Arab IV, it should be pointed out that at that length the Arab IV was actually supplanted by the Daimler CCG6 (Chesterfield at least having a Guy order transferred to Daimler), while Guy concentrated on 30-foot Arabs and dreamed of Wulfrunian orders. The 27-foot Arab V came into being eventually, but I understand only one batch were built – for Cardiff. There is a bit more history behind the Daimler CCG6. From 1959, Daimler tried to get more of the ‘non preselector’ market by introducing the CSG6 with the David Brown synchromesh gearbox. The David Brown box proved to have reliability problems, and when Jaguar bought the Guy company, the indestructible Guy constant mesh gearbox replaced the troublesome David Brown unit in the CCG5/6 models, which, like the Arab V, were available from 1962. 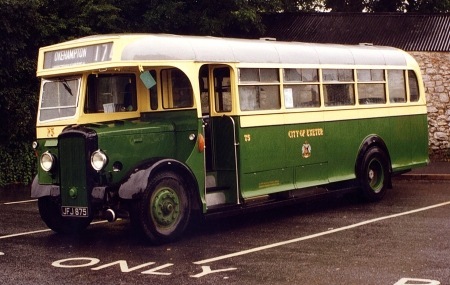 This PD2A/30 was new to Exeter City Transport in 1963, with Massey H57R bodywork. In this first view she was with Solent Blue Line, a subsidiary of Southern Vectis, established by two disgruntled managers of Southampton Citybus in 1987. Most of the time, 01 was the training vehicle, but she did operate peak journeys on some routes, notably between Southampton City Centre and the Thornhill Estate. A colleague who had the misfortune to travel on her on these occasions described her as a wreck. The current version of that route uses Mercedes Citaros! This view was taken at the Netley rally on 23 July 1989. In this second view, also at Netley, but on 12 July 1992, she has been restored to her previous Exeter condition. What a difference a coat of paint and a bit of care can make! 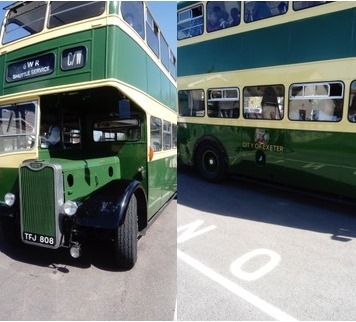 In case anyone was wondering, the bus alongside in the second view is the Maidstone & District Atlantean, 558LKP. In the "as restored" photograph she seems to have an enclosed platform (with doors? ), whilst in the earlier photograph she has an open platform . . . Looking at other photos on the web this seems to be a removable doorway to allow the owner to secure the vehicle on trips. There are plenty of pictures of it as restored without doors. Our moderator and I were wondering how soon readers would notice the presence or absence of a platform door! 1hr 14mins is pretty good going David. This Exeter City Daimler half cab is more than 60 years old, so even older than me, and is owned by John Handford and based near Solihull in the West Midlands. I’m fortunate to be able to navigate for John on this bus and he has taken it to the Kingsbridge 7ft 6in running day, events in Exeter and the trans Pennine run to name but a few. 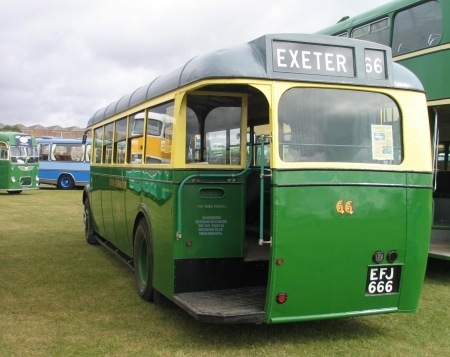 It has a genuine Exeter City destination blind and letters so in 2009 we took the bus to Exeter and met up with a former Exeter City conductor who worked on such buses and knew all the routes and stops. Here are two of the pictures I took during the tour around the villages near Exeter. The first on the way back from Upton Pyne at the junction drivers would stop at if passengers wanted to get on or off. The second is crossing the narrow bridge near the village of Bramford Speke. Visibility for navigating is not ideal, and communicating with John over the engine noise, it has an original Daimler engine, can be limited to reaching out to touch his left or right shoulder. A sister vehicle is preserved at Winkleigh and they were together for the Exeter Nocturnal event in 2011. It’s a long trip from the West Midlands to Devon – some 6 hours – an endurance test for John as the driver but also for me as the passenger. Nice vehicle though and full of character, you can sense all the ladies of the villages talking to each other about the latest news whilst they were travelling to and from the City with their groceries. I agree completely Norman – at Samuel Ledgard’s we had four Exeter Corporation Daimler CVD6/Brush double deckers which had their own very special "atmosphere." JFJ 50/51/52/55 were superbly appointed dignified vehicles full of real "quality" and even sported fascinating offside rear corner chrome bumpers which gave a lovely "pre 1948" touch. Ledgard policy was to equip all second hand purchases with powerful "KL" box type heaters – two under the lower saloon seats and one under the front nearside seat upstairs. As is well known, the large Daimler engines tended to run very hot, and I can honestly say that even in the cruellest of Winter days I’ve known passengers to plead for the heaters to be turned down or off, so effective were they. What happy days those were – and I’m saying this without a pair of rose tinted glasses anywhere to be seen. So, there’s an opportunity for someone in the Coventry area to bag a recording of a CVD6 for the Old Bus Sounds page – any takers? Ken…I think you may have intended to say next Saturday May 12th. Just in case anybody gets mixed up and misses your day! Exeter 66 had a role in the film ‘Remains of the Day’ with some very evocative night shots as Emma Thompson boards the bus. Did the rear offside seats on any of these single-deckers extend to the very back of the bus, possible because the platform would be split into two steps. The earliest of LGOC/London Transport’s T’s did, until most, but not all, were modified to front entrance. 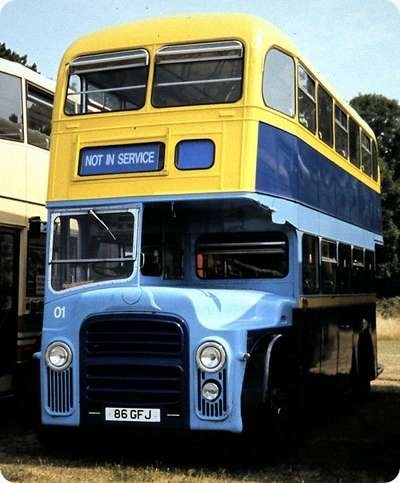 One, T31, is preserved in original condition and, as a rear passenger, I would have felt very insecure, I feel, when going around a right-hand bend! Thanks for the wonderful old photo’s. 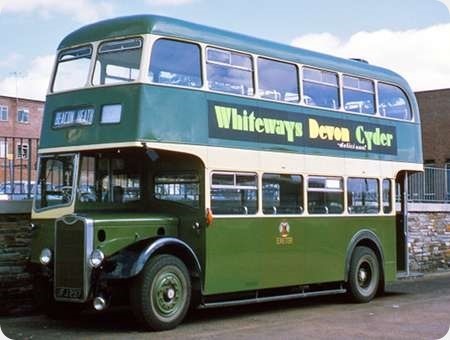 I drove these buses also the Guys & the Leyland PD2’s from 1963 to when Exeter City Corporation merged with Devon General, best years of my life. Great to see these old friends being preserved so well. My uniform was donated to the Winkiegh Museum. 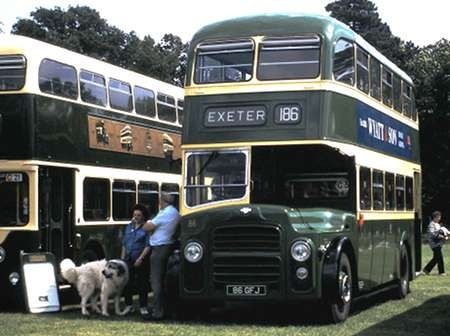 By the time that the last edition of the West of England BBF came out around 1966, the existence of half-a-dozen half-cabs as the only single-deckers in the fleet of Exeter City Transport was already of sufficient curiosity to be remarked upon. For several years during the ‘nineties, sister vehicle JFJ 875 (Exeter 175) was in the care of Carmel Coaches for operation on Dartmoor Rover summer Sunday service 174 between Okehampton and Moretonhampstead, seen at the latter on a rather damp 3rd August 1997. Unfortunately 175’s body wasn’t entirely Dartmoor-weatherproof by this time and a game of musical busseats usually took place when the rain started. In reply to some 5 year old messages! When the Dartmoor Sunday service 174 started, for the first few years the vehicle and the crew were provided by WETC (i.e. Colin Shears). I travelled one Sunday when the bus was driven by Paul Tucker and the conductor was Colin’s son Dan. Something which just showed how things which one generation takes for granted is completely foreign to the next; Dan was born around 1974 and it was apparent that, growing up in Bideford, he had never set eyes on a bus conductor. When the bus came to a stop, Dan would stand at the top of the steps and collect the fares as the passengers boarded – just like an omo bus driver which is what he would have been familiar with. Anyone who went on the bus for a nostalgic trip where the conductor came round and collected the fares after you had sat down must have been a bit disappointed. 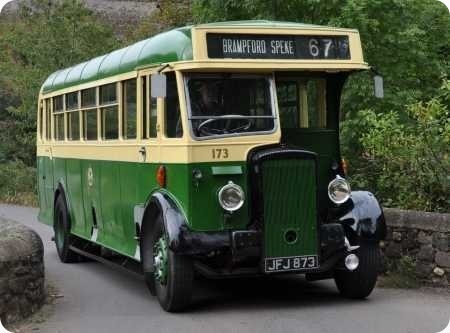 In reply to Chris Hebron’s question, the Exeter Leyland s/d’s of the 1930’s had open platforms at the rear. The whole layout is basically exactly as a normal double decker except that the offside of the platform on 66 and its sisters where the stairs would usually be, was occupied by some shelves for parcels. So far as I know, the JFJ Daimler s/ds were always front entrance.